Yesterday while running in Duane Reade for a much needed Starbucks Frap (on sale 2/$3), I decided to take a stroll down the nail polish isle. 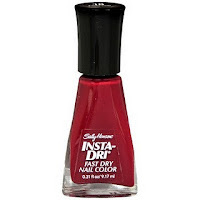 (Clearly NOT what I went in there for and on the job's time) I've been eyeing the Sally Hansen Insta-Dri Nail polishes. I wanted a nail polish that I could apply (somewhere in hiding, while at work) that would dry and not look a hot mess after 10 minutes. I went with Rapid Red (shown below) and upon immediate application of the first stroke, I'm HOOKED. I tested it on my thumb nail first and was immediately excited when it dried after 60 seconds. I did give it a few more minutes just because there wasn't any room for error. I had no polish remover for any mistakes, so my moves had to be precise! But after 5 minutes I was fully convinced, what they say is what you get! Now completely addicted since I don't always have the time to sit in a nail salon (and wait 20 minutes for my nails to be 75% dry), my plan of action is to invest in all of my favorite colors for easy on the go mani's! ﻿I can honestly say that I have never really been disapointed by Sally Hansen products. This one is by far my favorite for someone with very little patience and limited time. You are ALWAYS on point. I HEART you!! !